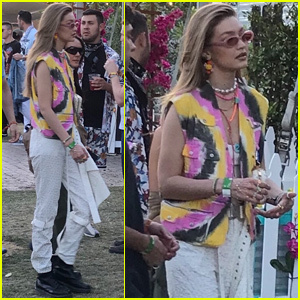 Gigi Hadid Shares Message of Peace in Israeli-Palestinian Conflict | Gigi Hadid | Just Jared Jr.
Gigi Hadid is advocating for peace in the Israeli-Palestinian conflict. The 23-year-old model took to her Twitter to post some of her opinions about the complicated issue following protests on Monday (May 14) that led to the death of over 60 Palestinians. Gigi, whose father is from Palestine, shared an article about the protests as well as information about the 70th anniversary of the Palestinian’s exodus from their homes when Israel was created. “I’ve said it before and I’ll say it again. For me, this is not about religion or one against the other – it’s about the greed. #FreePalestine #freegaza #coexist,” Gigi wrote. Gigi later wrote that due to the response to her posts, she will no longer be sharing her opinions on social media.